I've long been wondering where you can get a good view of the Olympic mountain range from the west or south side - as good as you get from Seattle or Puget Sound from the east that are just as distant from the mountains. I've found the spot, but it can only be reached in July through September, when the snow melts. 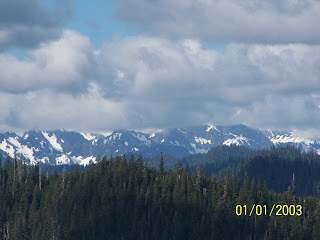 Sunday, June 22, 2008, we drove up the road towards Higley Peak, a small mountain on the west side of Lake Quinault. Just past the North Shore Road, where highway 101 bends and turns west, and then another mile further you turn right on Prairie Creek Road. This is a dirt/gravel road, which you will follow for 10 miles to the trailhead. The trail is just another half mile to the peak. Three to four miles in you come across two crossroads. Bear right at both of them. The first one is unmarked. The second has a sign pointing to Higley Peak Trail. There is a sort of third crossroads, where you need to turn left up the hill, but the alternative path straight ahead of you is fairly overgrown, so you are unlikely to choose that way. All the rest of the way the road is wide and clear to follow. We attempted this trip too early in the year. At about 7-8 miles up and two short of the trailhead, we were stopped by snow. We also had to navigate several obstacles caused by small, fallen trees. Some we drove over, some under, and sometimes I had our teenage boys jump out and bend a big branch out of the way. Despite the obstacles, we had a marvellous time. The road rises very quickly - quicker than you would guess, since you are mostly enclosed by the forest - and here and there you come out to a clearing with a marvellous view of the valleys below, the neighboring mountains, and the high, distant, snow-capped peaks of the Olympics. Even the teenagers with me were impressed by the beauty. Our five-year-old, James, saw each cliffside as a good opportunity to throw rocks. The older boys then started throwing rocks too. Once we reached the snow, we trudged on another two miles, hoping to reach the trailhead. The snow was patchy - 2 to 4 feet deep for a few hundred feet or up to a quarter mile - wherever there was shade, and then long stretches of bare road where the sun could reach the road. We had a fine, sunny day - one of our few so far this year. Eventually, we found a sunny spot, ate our lunch, and scouted ahead a little further. At a wide open area with a great view on both sides of the ridge, we stopped - ahead of us was another long, dark stretch of snow. In fact, looking at the map later, I think we might have passed the peak and its trail. I was worried about the five-year-old going back, but the road sloped downward gently, which encouraged him to keep moving. He played happily with fallen fir branches the whole way down. We will try this trip again in late August, and hopefully we will spot the trail. I usually prepare my visits carefully with a map and a plan for what to see, but this trip was more spur of the moment. I drove on up into the town of Westport, expecting to see the famous lighthouse - tallest in the state, but we didn't see any sign of it. That was very puzzling. We found a tall, blue watchtower and I figured surely that we would see the lighthouse from up there. But, again, there was no sign of it. The view from the watchtower was great: down onto Westport's marina, over the harbor, and across the harbor to Ocean Shores. Next, we went looking for a park to have our picnic. We found Westhaven State Park on the ocean. There was a whole crowd of surfers in wetsuits there, both coming and going. I counted 50 surfers out in the water at one time. However, the waves seemed to be too calm. Hardly any surfers managed to stand up on their boards. We picnicked on the 30 foot high clifftop overlooking the beach, giving a great view of the ocean, the jetty, and the busy beach (surfers and all their dogs running around). After lunch, James played on the beach and up on the jetty. We saw a flock of pelicans fly overhead - the first I'd seen in the area. I also saw a sealion pop its head out of the water. After the jetty, James noticed the cliff again and decided this was a great place to throw rocks. On the way back to the car - I thought we were done - we came across a really steep 100 foot sand embankment leading down to a perfect crescent beach. This beach faced into the harbor. Some crazy teen girls were there rolling down the sand, so of course James wanted to do the same. He backed himself slowly down the hill and climbed back up. Then he climbed back down again because he noticed a more dangerous spot the girls were trying to climb. The girls only made it up with the help of their Dad who went down to retrieve them. I had to do the same for James. We did finally spot the lighthouse in the distance from Westhaven. It was nearly hidden by tall trees. We drove around to the lighthouse, arriving just before closing time. The docent had climbed down, thinking he was done, but he climbed the 135 steps once again and gave us the complete tour. The original 1898 light was lit by kerosene, which had to be refilled every two hours overnight. Every day the keeper would clean the lens and the windows. The lens mechanism floated in a bed of mercury - a great lubricant, but nobody knew at the time how dangerous it was to handle. 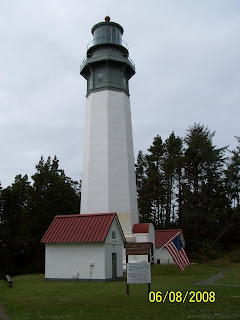 The lighthouse gives off a red/white pattern of light at a designated interval. Red/white means a safe harbor is nearby. The color plus the timing of the light could be compared to navigation charts to help boats identify the lighthouse. Next, we drove down to Grayland and stopped at Grayland State Park - another sandy beach on the ocean. There were lots of cars on this beach, including an RV with lawn furniture set out and a kite flying. James fell over on the beach and was caught by wave, getting wet and sandy, so that was the end of our day. We drove the 1 1/2 back to Pacific Beach and stopped for shakes at the Humdinger in Hoquiam. Today, Saturday, May 31, 2008, we had unexpectedly fine weather. Mostly sunny and we all went around without jackets. My wife says it rained back home in the Seattle area. I had four boys with me: the twins, Austin and Konrad; their friend Scott; and little James - 5 years old next month. 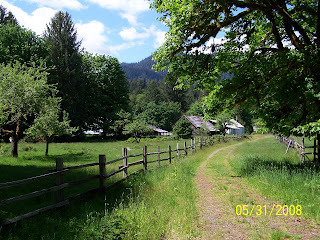 This day we drove around Lake Quinault - an approximately 25 mile circuit. About 1/3rd of the time you are driving on narrow gravel roads. These are well-maintained without a single pothole - at least on this day. Your first sight of the lake is at its western end from Highway 101. We started out on the North Shore Road for a clockwise circuit of the lake. Our first stop was for the Quinault Big Cedar. "Big" is an understatement. One might have said "ancient". The tree is barely alive - a few green branches can be spotted at the top. The outside of the tree is grossly gnarled and has lost all it bark - nothing like a young, straight cedar with the familiar strips of straight, red bark. The tree was entirely hollow inside. All five of us stood inside of it at once. Looking up within the tree you could see a patch of sky, so the hollowness extends clear to the top. It was a strange and fascinating sight. On the way back to the car, the kids spotted a stream, and we played there for a while. The big boys climbed onto a large log fallen and suspended over the stream. Little James tries to follow them wherever they go, but the climb onto this log was a bit too challenging. A few more miles down the road we stopped at the July Creek picnic area. One picnic table in particular has the finest view of any picnic table I know, with a commanding view of the lake and the hills behind. Directly across the lake you could just make out the historic Lake Quinault Lodge. There was a small beach here that the kids enjoyed. Beyond the eastern end of the lake we stopped at the trail to the Kestner Homestead. The sign on the road says "Maple Grove Trail" and the ranger station is here (closed this day). This was a most enjoyable hike: flat, short (1.5 miles), and with varied scenery. The trail starts out by following a dry stream bed through the forest. The trees are mostly maples here, but this being the rain forest, everything was draped in moss. The kids found a way down to the stream bed at one point, and played among the rocks. Further on, you reach a bridge over the dry stream - some very old, very large maples are to be seen here. And then you come out of the forest to open farmland and the homestead. The homestead was established around 1900 and the park service has recently begun to restore it. The grassy path, old wooden fences lining the fields, and the dilapidated farm buildings in the distance gave us all a sense of having stepped back into time by 100 years. Even the kids commented on it. The setting is lovely with forested, high hills in the distance and a peak of snowcapped mountains here and there. We found an old delivery truck, rusting away in place. The driver's cabin was entirely filled with vines. You could just make out some writing on the side: "local and long-distance" and a phone number. Beyond the old truck we settled into a meadow of tall grass for a rest. After the homestead, the trail returns to the forest: maples and moss again, but even more lovely than before. The next noteworthy sight was a crystal clear pond, where a certain leafy green plant grew both below and above the pond surface. It was difficult to spot where the surface was - a kind of strange optical effect. At least half of the drive around the lake leaves the lake and follows the Quinault River above the lake. We pulled the car over a few times for a fine view of the river and hills beyond it. Eventually, you reach a bridge and cross over to the South Shore Road. You'll pass three waterfalls visible from the road along this route. There are many possibilities for hiking along the South Shore Road, but it was getting late, so we made just two short stops. We spotted a large sand bank in the river and the road widened just at this point, so I found a spot to park and we played down by the river. The boys threw rocks into the river, while I went off looking for a good vantage point for pictures. After that, they noticed a large rock - tall as a house - looming over the river, so they had to climb that and risk falling into the icy waters below. I helped James up after the big boys and we all found room at the top of the rock.